Joseph Duffy feels like the pressure is now off as he gets set for his return to UFC action. 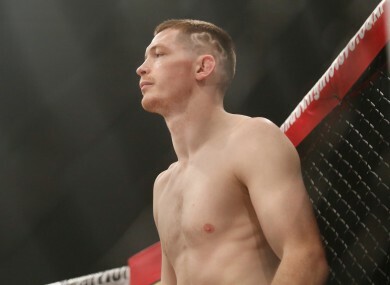 MAYBE IT’S THE fact that his defeat to Dustin Poirier dampened some of the hype, or perhaps it’s because he has passed the ‘Last Man To Defeat Conor McGregor’ moniker on to Nate Diaz, but Joseph Duffy admits that he “feels different” as he prepares to return to UFC action next month. After beginning his time in the UFC with two impressive first-round wins last year, Duffy was catapulted into a main-event meeting with Poirier in Dublin last October. A concussion sustained by Duffy postponed the bout until UFC 195 on 2 January, when the Donegal-born fighter dropped a unanimous decision to a vastly more experienced campaigner at the MGM Grand Garden Arena. The 28-year-old’s first-round submission of Conor McGregor in 2010, coupled with his stoppages of Ivan Jorge and Jake Lindsey in 2015, fuelled the considerable hype that Duffy brought into his fight with Poirier. It’s not something he was conscious of at the time, but was he feeling the pressure a little more than he had realised? Many believed that an opponent of Poirier’s calibre may have been a step too far, too soon for a man who was competing in the UFC for just the third time. However, it’s an assessment Duffy doesn’t agree with. Regardless of the outcome, there are no regrets. “I think in the long run it will do me good. It’s given me time to hone my skills and just let everything settle in. I was taking a lot on board and there’s only so much you can put into your game in a short space of time,” said Duffy. “The experience has done me good and so did the little break. I got back to Ireland to see my family and friends. It kind of reignited that fire under me. Despite being a proud Donegal native, the increase in Duffy’s profile has been accompanied by sneers from some observers — over-eager Conor McGregor fans, for the most part — at his status as an Irishman. Born in Donegal, raised in Wales and now training in Montreal after spending a few years in London, Duffy has ties to many parts of the world. However, none of them are as strong as his connection to Meenbanad and Burtonport on the Donegal coast. Email “'People can say what they like but I know who I am and who I represent'”. Feedback on “'People can say what they like but I know who I am and who I represent'”.